You won’t be able to take Mumbo out if he’s on top of his giant hat, he’s immune to damage when up there, so wait and he’ll come down to the floor to fight you, and then attack him. If Mumbo is off his hat and down on the floor fighting between the Titans he can put up a card shield that makes it impossible to attack him physically for a few moments. Wait for a few moments after this shield goes up and eventually it will come down and you can reach out and touch him. Once Mumbo has been reduced in health to a level that makes him vulnerable, he’ll jump back on his hat. While he’s up on top of his hat he’ll throw a shock-wave attack at the Titans along the floor, just time its passage and jump over it each time he sends it. Once Mumbo’s health is down to almost empty, you’ll be told by the game to position each of the five Teen Titans on their team attack positions. Icons with each of the Titans faces should appear on the screen, just put each of the matching Titans on their corresponding spots and then hold the Special button to make sure they stay in position. Once the Teen Titans are in the correct spots and anchored they will attack Mumbo with a super charged attack that will bring his reign to a quick end. In this next stage you will come up against enemy gunners that you can’t reach with your melee attacks, so use the barrels spread through the early parts of this stage to take them out. You will be attacked by flying robots in this next part, use projectile attacks to rid yourself of this nuisance as quick as possible. These dangerous robots fly around fast and attack with quick firing laser beams, so letting them fire away for any time can really bring the Teen Titans down in over all strength and health. Once you reach the end of this stage, you will see the enemy trying to load up a bunch of crates and then they will try to head for the hills. You must eliminate all of the enemy that appear in this area before they can get all the crates on the trucks and drive them away. Concentrate on using you’re charged up strong attacks to quickly take the enemy out of the picture as quickly as possible. After you defeat a few groups a giant white robot will show up, along with another horde of weaker fighters. Take out the giant robot first because he will take considerable damage before going down, and then wipe up the remaining lesser fighters before the last truck can vacate the area. In this stage you wil face off against Raven in several parts, but she will eventually leave her men behind and put up an energy field. To progress to the next area you’ll need to pick up several of the inmates and heave them against the field to capture them without hurting them. The easiest method is to attack them with triple fast attacks to stun them and then pick them up and do your business. Next, you’ll encounter hallways with laser grids that need to be turned off, do this by heaving anything you can find into the beams of a grid. The designers have provided you with handy barrels to use for this purpose, or use your normal projectile for this job, an inmate with flexible arms and legs. In the later part of this stage you will encounter a creature you haven’t seen before, Plasmamen, a pink blob that is funny and not that tough to beat. They do break up into three smaller blobs after receiving sufficient damage that are just as easy to kill as the bigger blobs, and they have the bonus of leaving behind items, like health and full-charge power-ups! 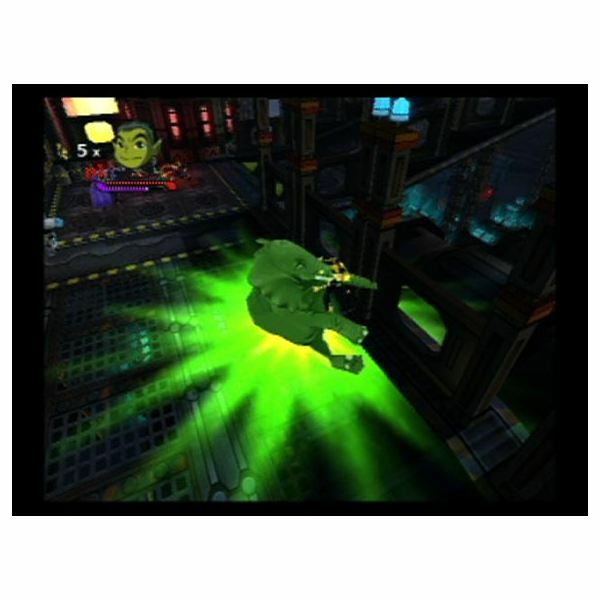 The ninth stage has you battling Plasmus, he’ll try to stay in the middle of the room for the duration of the fight, throwing giant blogs of goo at the Teen Titans. Grab all the explosive barrels that have been left in the room and attack Plasmus with them. Keep your character moving around to avoid Plasmus’s attacks and then pick up a barrel and toss it at Plasmus between his attacks. 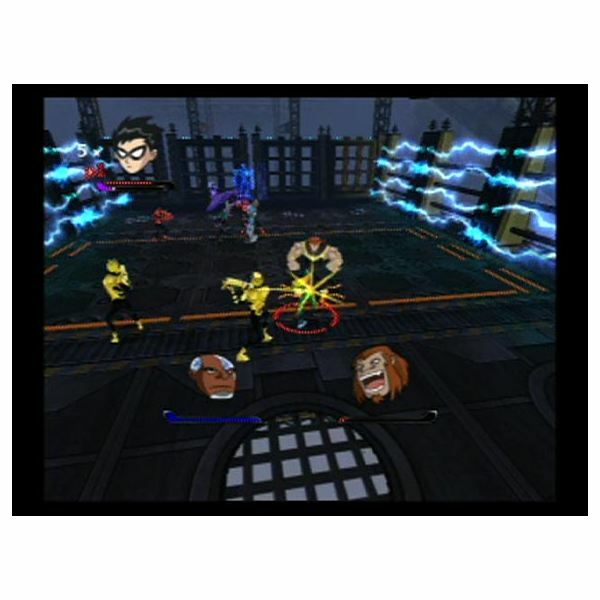 Once Plasmus has been reduce in health to empty, you need to once again position each of the Teen Titans on their designated spot and hold the Special button to power up the team attack. 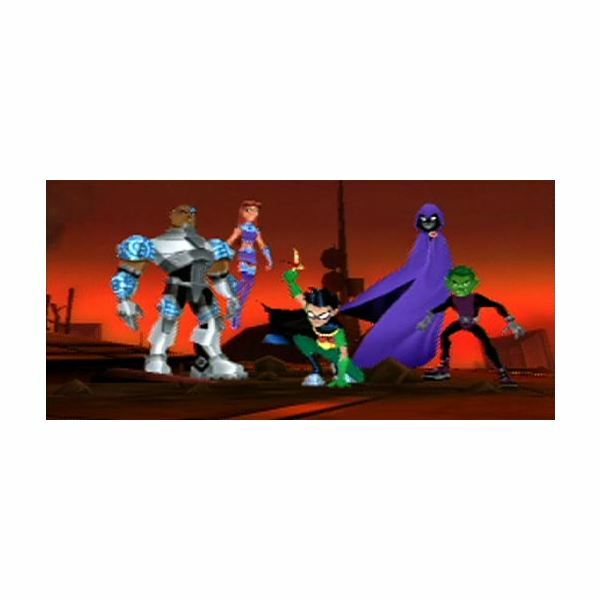 After all of the Teen Titans are in their correct spots, the Teen Titans will combine their attacks to send Plasmus to his maker. You will have to eliminate all the enemy in each area of this stage in order to go forward to the next stage. You will fight a few different types that aren’t that difficult to defeat, including a few rifle-carrying soldiers isolated from your melee attacks on distant platforms. Implement the beam weapons of Starfire and Cyborg or pick up and toss barrels or other enemy soldiers at them to knock them off their perches. You will come to a big area with an electrified gate that you can’t pass until you take out all the enemy on the ground level and then take the elevator to the level above and eliminate all the soldiers there. You need to throw all the explosive barrels at the three generators from above to turn them off, and then go to ground level again and pass through the gate, now that’s you’ve brought it down. The fight travels into a working train yard next; there will be high-speed locomotives speeding through occasionally, so keep the Teen Titans off the train tracks. You can maneuver the enemy soldiers onto the tracks somehow, and let the speeding trains take them out of the fight or just take them out the old fashined way. A collection of articles about Teen Titans.